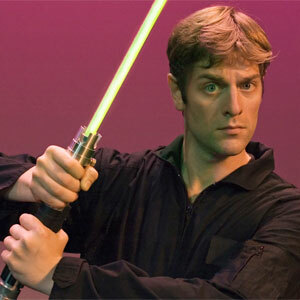 Canadian writer/performer Charles Ross is bringing his One-Man Star Wars Trilogy to the Coolidge Corner Theatre in Boston on November 15. In this kinetic presentation, Ross plays all the characters, recreates the effects, sings from John Williams’ score, flies the ships, and fights both sides of the battles from the original Star Wars trilogy, punctuating his virtuosic performance with captivating factoids and editorial asides. Believe it or nor, he uses no costumes, no props, no sets. It is just him using his yoga-limber body, remarkable knack for voices, subtle changes in facial expression, and manic levels of energy to put his own distinct stamp on the Star Wars universe. Where did this quirky concept come from? I can’t be sure, but I think it might stem from the fact that by the age of 10, he had watched the first Star Wars film on videotape more than 400 times and committed virtually every line to memory. Ross got the idea for One-Man Star Wars Trilogy in part while playing a game of Frisbee, where each player had to quote a line from Star Wars with each throw and catch. He went on to collaborate with friend and director TJ Dawe to bring the show to life. Ross first performed One-Man Star Wars Trilogy in Toronto, Ontario in January 2001, and spent the next few years touring fringe festivals. Word of his act spread, and he has since performed the show to sell-out crowds in more than 250 cities across four continents. From off-Broadway in New York to Londonâ€™s West End, from Dubaiâ€™s resorts to Comic-Con, One-Man Star Wars Trilogy has been places. In April 2005, Lucasfilm tapped Ross to perform at Celebration III, the mega convention held in Indianapolis to mark the release of Star Wars Episode 3: Revenge of the Sith. It may come as no surprise that Ross is also the mastermind of One-Man Lord of the Rings, in which he takes audiences on a romp through Middle Earth. Tickets to One-Man Star Wars Trilogy are $20 general admission/$17 Coolidge Corner Theatre members. Tickets are available online at www.coolidge.org/onstage or at the theatre.